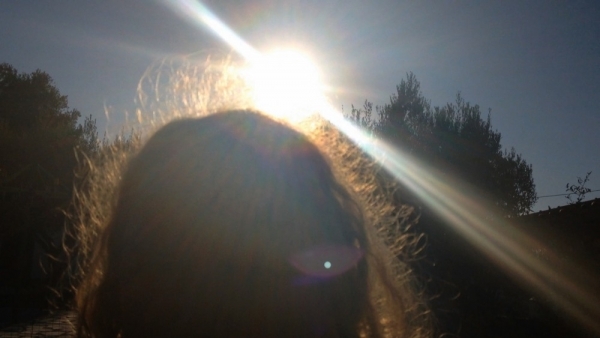 For her first solo exhibition in Ireland at TBG+S, guest curated by Linsey Young, Charlotte Prodger will present her recent Margaret Tait award winning work, Stoneymollan Trail. This feature length single-screen video revolves around the idea of screens and how they measure and mediate subjectivity. Comprising material from multiple formats that includes an archive of miniDV tapes that Prodger shot between 1999 and 2004, recent footage shot on her iPhone and HD camera, recorded voiceover and screenprinted graphic forms, Stoneymollan Trail traces a history of recent video formats as well as the artist’s personal history. Charlotte Prodger was born in 1974 in Bournemouth, England. She lives and works in Glasgow. Selected Solo Exhibitions include ‘8004-8019’ at Spike Island, Bristol, ‘Markets’, with The Block at Chelsea Space, London, ‘Nephatiti’ (Glasgow International Director’s Programme), McLellan Galleries, Glasgow(2014), ‘Percussion Biface 1-13’, Studio Voltaire, London, ‘Jason Loebs and Charlotte Prodger’, Essex Street, New York, ‘:-*’, CCA Intermedia, Glasgow (2012) and ‘handclap/punchhole’, Kendall Koppe, Glasgow (2011). Performances include Re: Re: Homos and Light at Artists Space, New York, Fwd: Rock Splits Boys commissioned by Electra at Café Oto, London (both with isla Leaver-Yap), microsphaeric howard hughes heaven movie at Tramway and Orange Helvetica Title Sequence at NY Art Book Fair, MOMA PS1, New York. Her writing has been published in F.R. DAVID, Happy Hypocrite, Frieze and 2HB. She was shortlisted for the Jarman award in 2013 and won the Margaret Tait award in 2014. Charlotte Prodger is represented by Koppe Astner. Linsey Young is currently Curator at the British Council in London where she is developing a large scale painting exhibition and accompanying catalogue and a major commission in Nigeria with Glasgow based artist Laura Aldridge. Before joining the British Council she held curatorial positions at the Scottish National Gallery of Modern Art (SNGMA) and Inverleith House in Edinburgh where she developed exhibitions and commissions with artists such as: Marc Camille Chaimowicz, Philip Guston, Robert Raushchenberg, Claude Cahun, Luke Fowler, Karla Black, Sue Tompkins and Martin Boyce. Young formed the independent gallery YOUNG TEAM in 2013 and continues to present a series of exhibitions and editions with artists such as Jonathan Meese, Sue Tompkins, Giles Round and Michael White.